A Sitemap allows you to create a file hosted among the other files in your account that informs the search engines of all pages your website contains. In other words, it provides the search engine with detailed information about the content of your website. Here, this content will show how to create the sitemap. 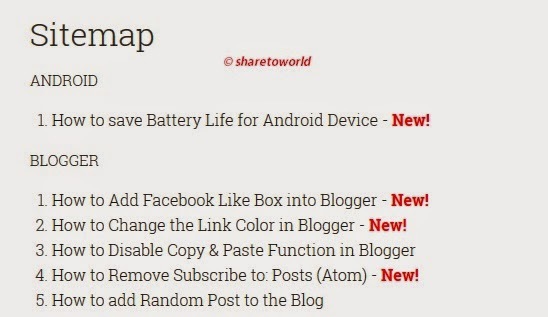 After adding the above code, replace http://sharetoworld.com with the address of your blog. - To change the color and font size of categories title, replace the values in Red. - To change the color of the links, replace the value in Green. 4- Click Options on the right side and select Don't allow (hide existing) for the reader's comments.